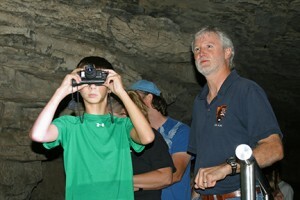 Kentucky’s Mammoth Cave National Park is holding its third annual Bat Night this Saturday, August 31st. As part of the event, park staff have scheduled activities to take place throughout the day and into the evening, the prime time for viewing bats. During the daytime visitors will have the opportunity to view poster sessions and a display of fascinating bat information. Then in the evening, visitors can rotate through several stations located between the Visitor Center and the Historic Entrance. Each of the stations will highlight different scientific techniques and equipment used in bat research. Some of the stations feature light-trapping of insects, bat sound recording, thermal imaging and night vision goggles. Park staff and scientists will be on hand to explain the equipment and answer questions. Mammoth Cave National Park is home to eight species of bats that frequent the park caves, and five other species that roost in its trees. Saturday’s daytime activities will run from 11:30 am to 2:00 pm at the park Visitor Center, while evening activities, also at the park visitor center, begin at 7:00 pm. Activities designed for younger visitors are scheduled at 10:30 am, 1:00 pm, 3:30 pm and 5:00 pm at the Visitor Center.